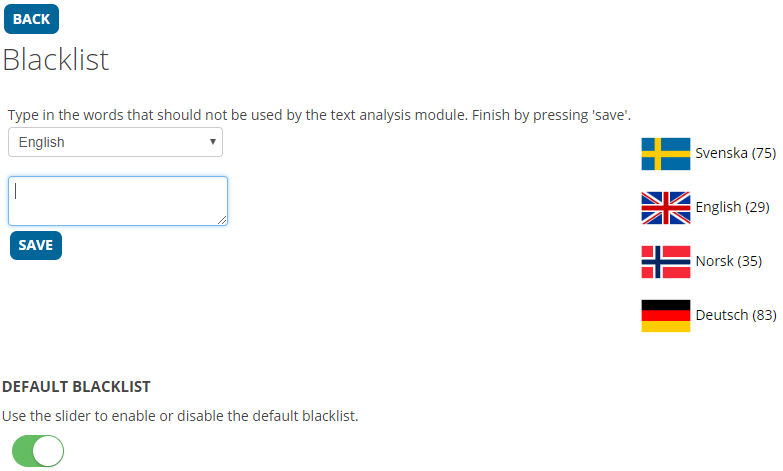 Blacklist is a function used to filter out words that should not be used by the text analysis module in the survey reports. A word that is blacklisted will never be displayed in the automatically generated word clouds. How do I add words to the blacklist? To add words to the account blacklist you will need to start by selecting what language the word is by selecting the language in the first drop-down menu. When a language have been selected you can move down to the open text area and write the word/words in that area. If you have several words, separate these by a single row-break. Add the words to blacklist by pressing Save.